Revealed last March at the Geneva Motor Show, the all-new Ford Fiesta lineup will, once again, include a new ST hot hatch. That’s the good news. 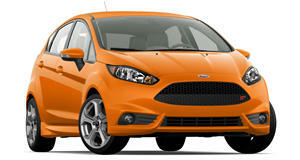 The bad news is that a few months ago Ford announced the new Fiesta won’t be coming to the US. Why? The market has changed and customers want crossovers more than ever, hence the definitely coming to the US EcoSport. But what about the new ST? At one point Ford sounded like it was keeping the door open for a US arrival, perhaps in only very limited numbers. Well, it’s not happening. We spoke with Ford Performance of Europe Director Leo Roeks at Frankfurt a few days ago and brought up this very subject with him. “It’s simply a matter of a lack of interest in the B-segment in America. It doesn’t make sense, nor is it possible financially speaking, to import a single trim level, and a niche one at that,” Roeks said. We can’t say we’re entirely surprised, but we wanted this issue clarified once and for all. As for Europe and other parts of the world, they’ll have their choice between either a three- or five-door Fiesta ST, whereas the outgoing model was five-door only in the US. Under its hood lies a turbocharged 1.5-liter three-cylinder engine, which replaces the turbo 1.6-liter four-cylinder. Not only is this new engine more powerful, but more fuel efficient as well. “This is something I’m particularly proud of,” Roeks specifically pointed out regarding the new engine. We also asked whether this new Fiesta ST was capable of handling an all-wheel drive system, something its predecessor couldn’t. The answer: no. Adding AWD would simply make the car too heavy, and that’s just for starters. “It would completely change its overall dynamics,” Roeks added. And so, that’s that. No more Fiesta ST for America. It was great while it lasted.